I’ve missed you! And, I wrote a new book! It’s been way too long since I’ve written here, and so much has happened. I’m not sure how to organize it all! I’ll just dive in, and hope you can follow along. If you’ve followed my story, you know that I have struggled to write because of severe and chronic pain that makes it difficult to type. I have been able to type in short bursts, but rarely more than a page at a time. I tried dictation software, and it functioned fine, but my brain just doesn’t work that way. My thoughts flow more elegantly from my fingertips than they do from my mouth. Last year, we moved to a new city for my husband’s job. 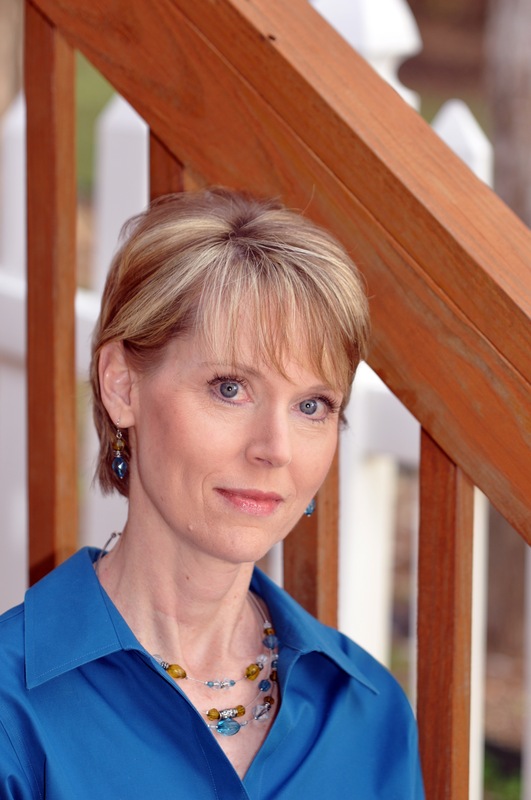 We were just settling in to our new home when I was diagnosed with breast cancer. I was stunned. My family has no history of breast cancer, and I didn’t have any of the known risk factors. Fortunately, it was caught early (please do all the recommended screening tests!). I had surgery and then went through five weeks of daily radiation therapy. The radiation left me exhausted. I spent most afternoons in my recliner, with my two Bichons (Lily and Larry), curled up on my lap. When I was nearing the end of my radiation treatments, I was approached by a publisher with an offer to write a book on self-confidence. Initially I said “no.” I had written four books in the past, and I assumed that part of my career was over. It wasn’t physically possible for me, with my chronic pain and now my fatigue, to write a book. But, the idea kept popping up in my head! Who thinks of taking on a huge task when they’re exhausted and in pain? I do! Writing makes me feel alive! I want to do this! One of the things I like about myself is that I’m a creative problem-solver. I knew if I were to write this book, I would need help. If I could find a co-author, it would decrease the workload while still giving me a meaningful project in which to immerse myself. Immediately someone came to mind—Celia Ampel. I had met Celia in a round-about way through my son years ago. As a graduate of the prestigious University of Missouri School of Journalism, she is a great writer. I also knew she was interested in psychology as we’d collaborated on a few blog posts a while back. She lives in Florida now and I decided to text her to gauge her interest and availability. The timing was perfect! She had just decided to leave her job and do some freelance writing, and she said she was definitely interested. Yippee! We signed the book contract and off we went! We met over Google Hangouts to discuss ideas and used a shared Google document to write. She was the best co-author I could have. We were always completely in sync (we decided it was because we are both INFJs on the Myers-Briggs test and “Rebels” on Gretchen Rubin’s Four Tendencies test). We had very tight deadlines, met each one early, and completed the entire book in under ten weeks (while I was also still working my regular job)! I can’t believe how much I was able to write, or the amount of time I was able to sit at the computer. I was on a mission. Writing with Celia was so much fun I didn’t notice the pain as much, and what discomfort I had was worth it. We both felt good that we were working on a creative project that had the potential to help so many people. At the end of the writing process, Celia came to St. Louis to visit. It was so nice to see her in person. My husband, Greg, took pictures of us together, looking confident, of course. I’m not ready to quit writing. I still have things to say. As I type this, I look around my office for inspiration. My eyes land on a small painting that my husband gave me after I completed my radiation treatments. He had asked a local artist to do a one-of-a-kind piece for me. I love the work of Janice Scherer who is known for her “Stripy Arms” paintings. She had met me once and didn’t really know me, but magically her painting fit me and my situation perfectly. My brother, Bill, with my parents after the race. My brother, Bill, was diagnosed with Parkinson’s Disease several years ago. In late November 2012, he underwent brain surgery to implant deep brain stimulators in the hope that these would help control his symptoms. If you haven’t already, you can read/see more about Bill’s amazing story in this blog post, My Brother, My Hero, My Friend. Two months after the surgery, the doctor gave Bill permission to resume exercising. 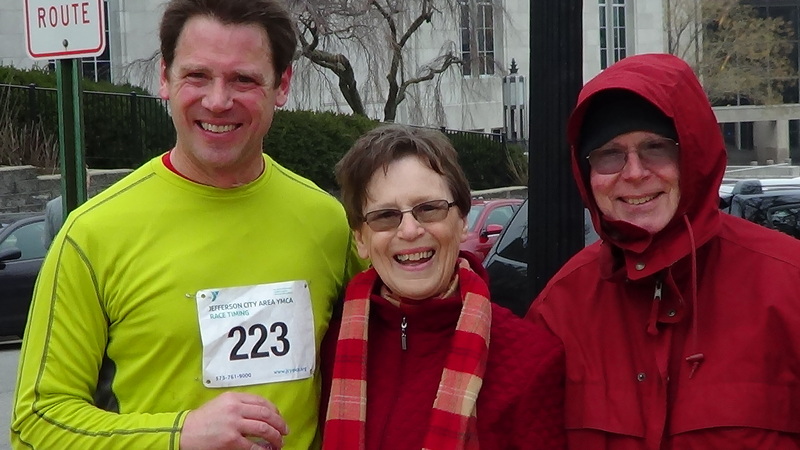 Just seven weeks later, Bill competed in a 5K race in Jefferson City, MO. He covered the hilly terrain in 29:44. Bill enjoys running and says it is actually easier to run than it is to walk. He sets concrete, achievable goals. He says he likes to focus on running because “Parkinson’s is too big.” His next running adventure is in 3 weeks: he’ll be on a marathon relay-team in St. Louis. He is feeling much better since the deep brain stimulation (DBS) surgery. He is back at work full-time. He says he feels hopeful and he sees that he has his whole life ahead of him. I’ve been doing a lot of video interviews with him, and will post more as I can. For any friends and relatives reading this, Bill has said numerous times that he couldn’t have done this without all of your love and support! A big shout out to my son for helping me (A LOT) with this video. 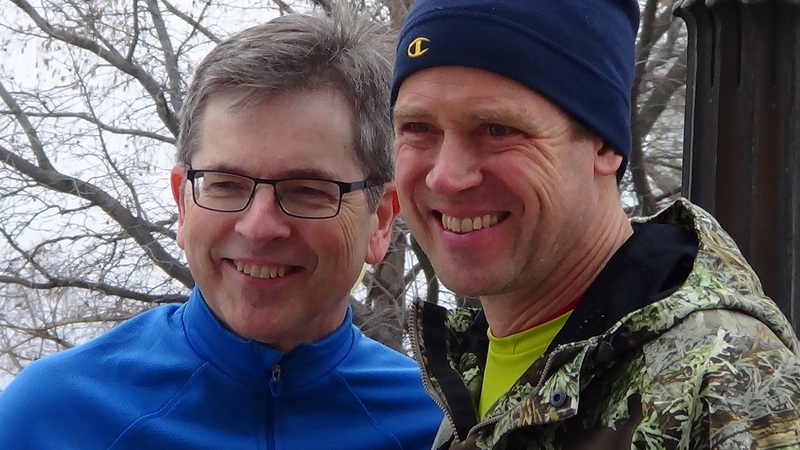 Here’s a picture of my husband, Greg, who also ran, the race, with Bill. So many people have already posted their word for the year, and as usual, I’m a few steps behind. Oh well. My word for the upcoming year is Open. Greg actually suggested the word to me. He said, “What about the word open?” and I immediately said, “Nah…” There I was shooting down an idea before I really thought about it. Not very open of me. And here’s another interesting tidbit. I finally decided that Open was going to be my word. Then today I clicked on Ali Edward’s Word of the Year blog, and she had just announced that her word for 2013 is Open. I felt a little deflated. She took my word! But that’s okay. I’m sure there’s enough space (openness) in the world for us both to have the same word. Open to possibilities. I tend to get locked down in my thinking…not being able to see there may be many paths, many ways of doing things, if I’m only open to seeing things in a new way. I also think I may be on the brink of some changes in my professional life, and I want to be open to seeing that there may be many ways I can share my talents. Open to taking risks. I’m quite risk aversive. I have to push myself to try new things. My worry brain is always telling me to play it safe. I really don’t have anything in mind when I think about risks, but we’ll see what happens. I may surprise myself and do something crazy. Open myself up to people. I used to be painfully shy–not so much anymore, but I’m still a through-and-through introvert. I don’t let too many people really get to know me. And if I do, it takes a long time. I can work at a place for years and barely make a dent in getting to know my coworkers. I want to make a conscious effort to change this and share more of myself with others. I need to make a few more friends, too. It’s kind of hard to find friends when you’re fifty. I’m excited about the word Open. It’s a noun. It’s a verb. It’s an adjective. It’s a Superword! The very word itself implies adaptation and flexibility, two things I need more of in my life. And in the spirit of flexibility, any variation on the word open is okay. I like the word openness, too. Here’s a great quote I found on Good Reads. I have always been a baseball fan, and I grew up wanting to play for the St. Louis Cardinals. I remember pitcher Bob Gibson who was such an intense competitor that he continued pitching after suffering a broken leg. I never made it to the major leagues, but I did pitch in college. When Barb and I were dating about 25 years ago, we went to a Cardinals game together. It was miserably hot as it often is in St. Louis, and I was very focused on the game. She said I ignored her and she swore afterward that she would never go to another game (one of our first fights). Over the years, she grew to tolerate baseball and even have some fleeting interest. Of course, her interest was most intense when our son was playing little league and I was coaching. She loved the games and wanted to document every moment. Once she was taking pictures of our son warming up to pitch when one of his throws got away. The ball hit Barb squarely in the shin. Over the next few days, we watched as her leg took on a variety of technicolor hues. Barb may be very gentle, but she is also very tough. This brings me to today. 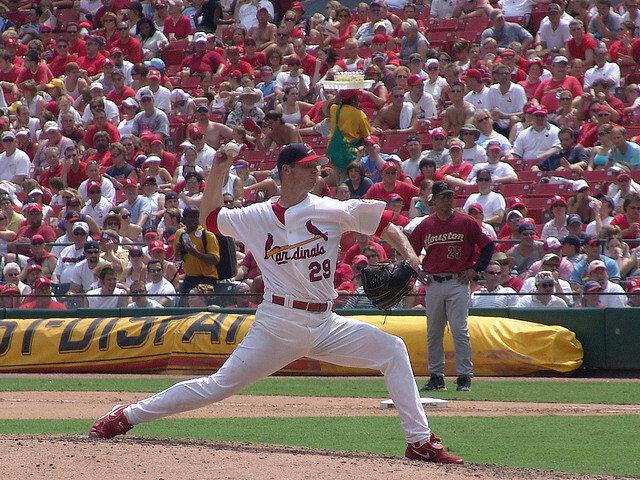 Chris Carpenter is pitching for the Cardinals. Carpenter has been the ace pitcher for the Cardinals for several years, and he was a key to their championship in 2011. Carpenter has been out all season due to chronic pain, numbness, and weakness as a result of thoracic outlet syndrome. Just two months ago, he had a rib and part of his scalene muscle surgically removed. His return today is a testament to his determination. In baseball parlance, he is a gamer. So, why am I writing about a baseball player on a self-compassion blog? Those of you who follow this blog regularly know that Barb has been struggling with chronic pain. Like Chris Carpenter, she has thoracic outlet syndrome. She was diagnosed by the same doctor that first identified Carpenter’s condition. Barb and I feel a kinship with this major league pitcher that we’ve never met. Barb works at a job that requires a tremendous amount of typing. Typing (or any repetitive motion, such as pitching) exacerbates the pain of thoracic outlet syndrome. But, just like Bob Gibson pitching with a broken leg, Barb continues on with pain. She doesn’t like to complain–she just wants to do her job. Today, though, Barb went against her basic nature. With my encouragement, she talked to her boss and explained her condition. Barb had been dreading this because she does not like to call attention to herself, but I thought she should let her supervisor know in case she needed anything down the line. Perhaps in an effort to channel Chris Carpenter’s determined spirit, she wore a Cardinals shirt to work (it was a “dress-down Friday). Her boss responded very reassuringly, telling her that she is one of the agency’s “rock stars,” and that they would do anything possible to support her. Cardinals fans revere Chris Carpenter. He competes intensely, and by his example, he brings out the best in his teammates. His efforts are seen on televisions across the country. I love the lessons and mythology that come from sports. But, as I talk with Barb tonight, I realize not all warriors wear uniforms. Not all heroes are famous. Let’s acknowledge all those who struggle with dignity, and let’s love and support them. We are hard-wired for story…it is all the way down to a neurological, biological, cellular level.We desire connection to others by telling our stories, but we’re afraid, as well. 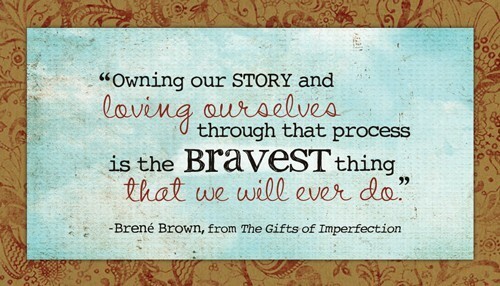 When you care about telling your true story, you leave yourself vulnerable. But the minute you stop caring about what other people think is the minute you lose your capacity for connection. When Brene´ sits down to write or prepare for a talk, it is still hard for her. The anxiety and fear are still there, but she does it anyway. She says people think she has everything figured out, but she doesn’t. She still struggles with being vulnerable. She still struggles with perfectionism. She was given the message: don’t share too much about yourself; it’s not professional. When she gives talks about her research, the thing people want to hear are the stories. They don’t care about the statistics or the graphs. Her goal when writing is to tell the truth and walk away feeling proud of what she wrote. She cannot control the outcome. Whether it’s a blog post or a book, she can’t control the comments, the views, the sales, the reactions. You press publish, you put it out there, and you go from there. Brene´ has a new book coming out, Daring Greatly, and you can preorder it from her website and get special “party favors” along with it. Who doesn’t love party favors? This is the essay I wrote for the MORE model search, which I wrote about here. The judging was based 50% on a brief (there was a strict word count) essay answering the question, “What makes you feel beautiful, inside and out?” and 50% on a photo of yourself. I used the picture to the left. At the time I entered, I couldn’t post the essay on this blog. Well, I didn’t win, but I’m still glad I entered. In case you didn’t click over to MORE’s site before, here’s what I wrote. I don’t know if Ashley Hasty’s favorite color has always been purple, but she sure shows a passion for it now. 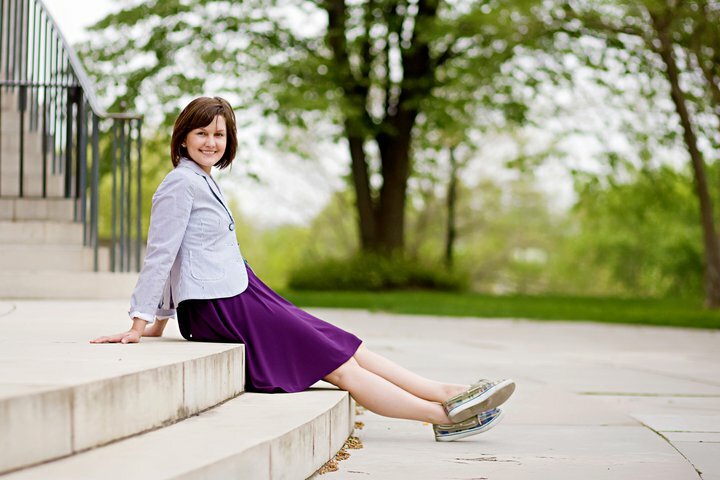 Ashley accessorized her purple dress differently each day, took pictures, and wrote about the experience on her blog. She generated quite the media storm in Mid-Missouri and was featured in most print publications, in addition to making several TV appearances. She’s since moved to Indiana (where she teaches textiles at IU), but is continuing the project there. This year, she switched things up a bit and decided to get other people wearing purple dresses–smart girl! 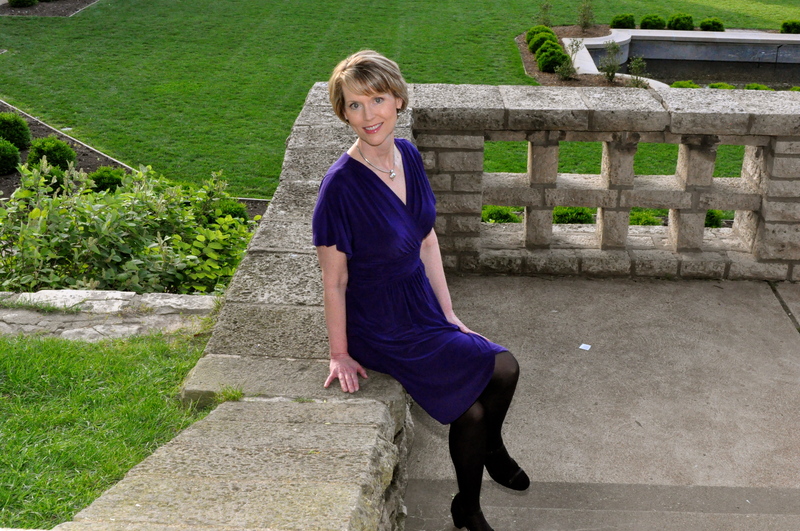 She proclaimed Tuesday, April 24, 2012 as Paint the Town Purple Day. Supporters are to wear a purple dress and post it to her Facebook wall. Ashley’s mother is my neighbor, and she was also my son’s fifth grade teacher. They’re a great family and I was eager to help out, especially since it involved shopping for a purple dress! For any fashionistas out there, the dress I’m wearing in my photos (below) is an Evan-Picone, bought on a clearance rack for $30. 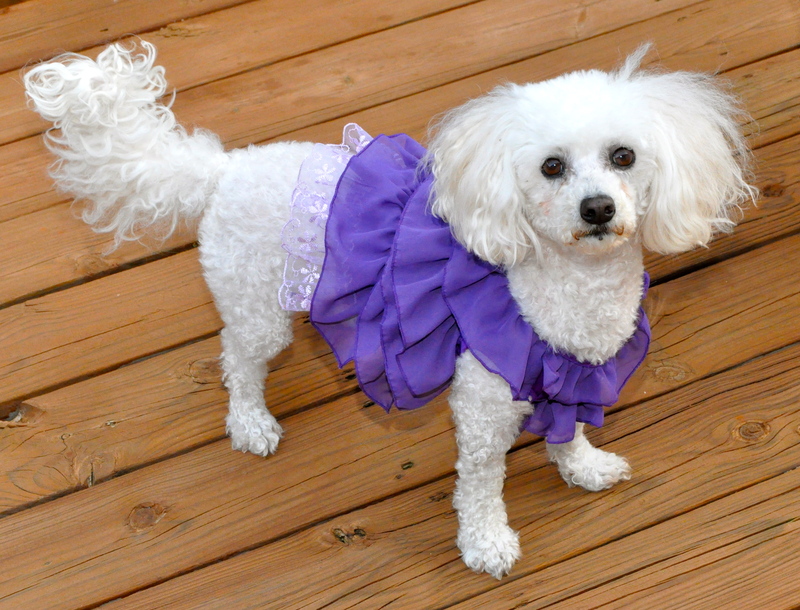 I was extra excited when I found a purple dog dress at Target, which I just had to buy for Lily, my Bichon who happened to get a bad haircut the day before. You can see more photos of Lily and me on my Facebook page. I’ve also made a donation to The Crohn’s and Colitis Foundation of America. I know we all get asked to donate to many worthwhile causes. Ashley makes it clear that no amount is too small. To donate to The Purple Dress Project/CCFA, click here. And if you can’t donate, that’s fine, too. Just reading this and being more aware of this disease will make Ashley’s day. For more information on these disorders, check out this site: Crohn’s and Colitis Foundation of America (CCFA). To follow Ashley’s journey, and to see fun pictures of people (and dogs!) wearing purple, click here. Hi! My name is Barb Markway, and I'm so glad you're here! I'm a psychologist and writer, with a special focus on spreading the word about the the power of self-compassion. I’m also a wife, mother, owner of two fluffy white dogs (Bichons), and a homebody. I’m overly serious, but working on it. Be sure and follow me on Facebook! Welcome to The Self-Compassion Project!